Last week in this post I shared how I strive to create a positive classroom community beginning on the first day of school. 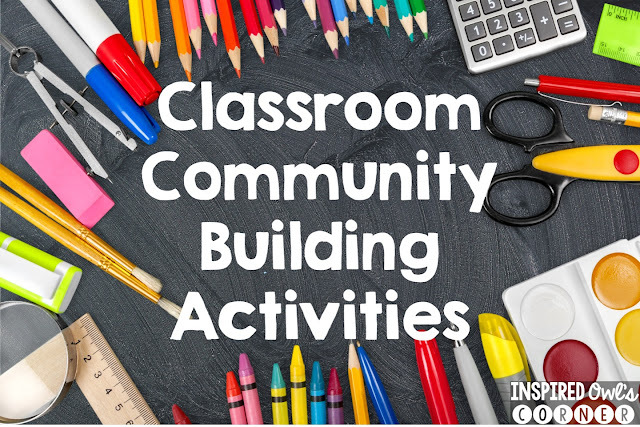 Right from the start, students need opportunities to build a sense of community and bond with their classmates. 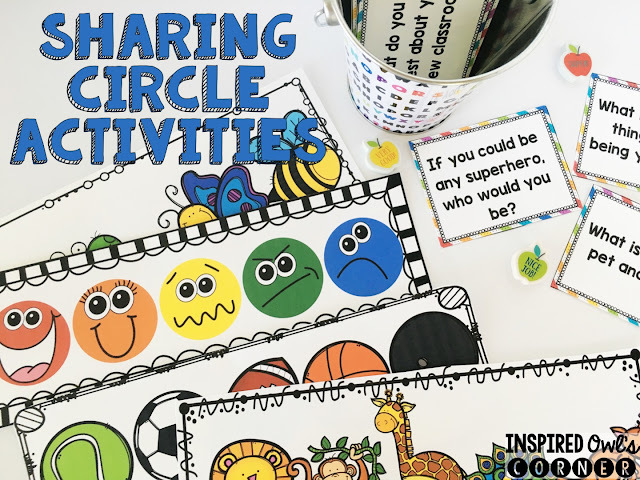 One thing I've found that has helped to create a positive classroom community in my classroom is sharing circle. Every morning after I take roll and lunch count, I call my students to come up front to the carpet and sit in a big circle. 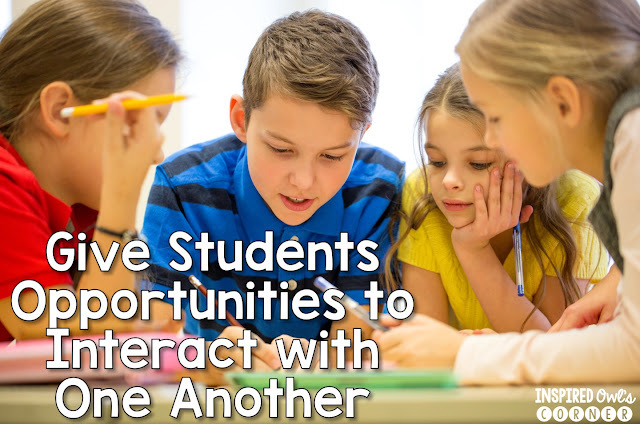 Students practice thoughtful, attentive listening while their classmates share one at a time. Everyone gets a chance to speak, and I allow them to pass if they would rather not share. Sometimes I have them answer the same question and other times I have them pull a question out of a bag. You can use any questioning prompts to get them to share such as: what is your favorite movie, song, book, food, etc. The ideas are endless! I like to change it up each day to keep it fresh and fun. 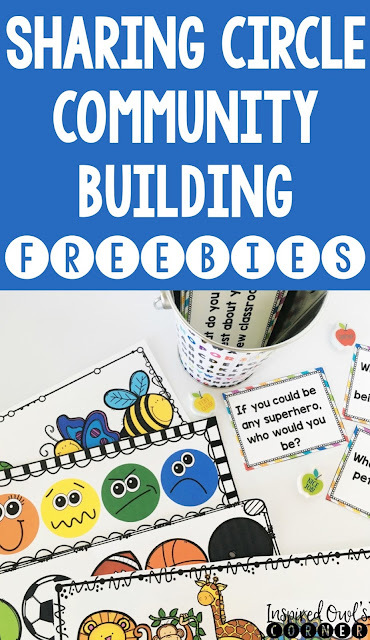 Another activity for sharing is to have students pass around a card with pictures on it and ask them which picture they are feeling most like and why. There are no right or wrong answers. They always come up with the most unique responses. 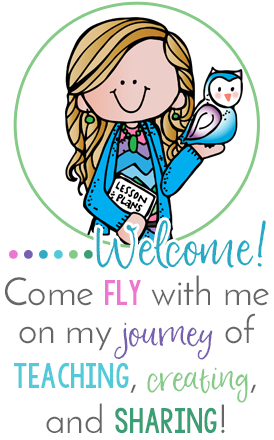 If I don't give students a bag filled with prompts or a card to pass around, I give them something to pass around such as a stuffed animal or a plastic toy microphone. All eyes are on the person who is holding the item. Sometimes students don't want to share, and that's fine. I allow them to pass. After everyone has a chance to share, I ask if there is anyone who passed and would like to share. Most of the students who pass end up sharing at the end. What I love about coming together for sharing circle every morning is that I can get a quick glimpse of how my students are feeling. Sometimes students are having a rough morning, and other times they are going through something difficult at home. By knowing this first thing in the morning, I can give those students extra attention throughout the day. It gives me a heads up and I will know to be more patient with them if they are having issues. Their classmates tend to do the same when they are aware. When I consistently do sharing circle, I have less behavioral disturbances during the day. Students get a chance to speak and be heard first thing in the morning and are less disruptive. Sometimes we talk about issues that are going on during recess or lunch. It helps them to resolve their problems so they are better able to focus on their classwork and sets the stage for a positive classroom culture. At the end of the first day of school, I like to have my students get into sharing circle and tell about one positive thing that happened to them on the first day of school. It's a great way to end the day and send them home feeling happy about their new classroom. I spend about a week doing sharing circle first thing in the morning and the end of the day. After that, we get together for sharing circle in the morning only. I have created a Sharing Circle pack for you. I hope you find the tools included helpful if you begin using sharing circle in your classroom. You can download it for free HERE.